Richard B. Russell Library for Political Research and Studies: Happy Electronics Records Day! Today, October 10, is a day set aside by the Council of State Archivists to raise awareness of the importance and challenges of keeping electronic records (computer files) usable into the future. 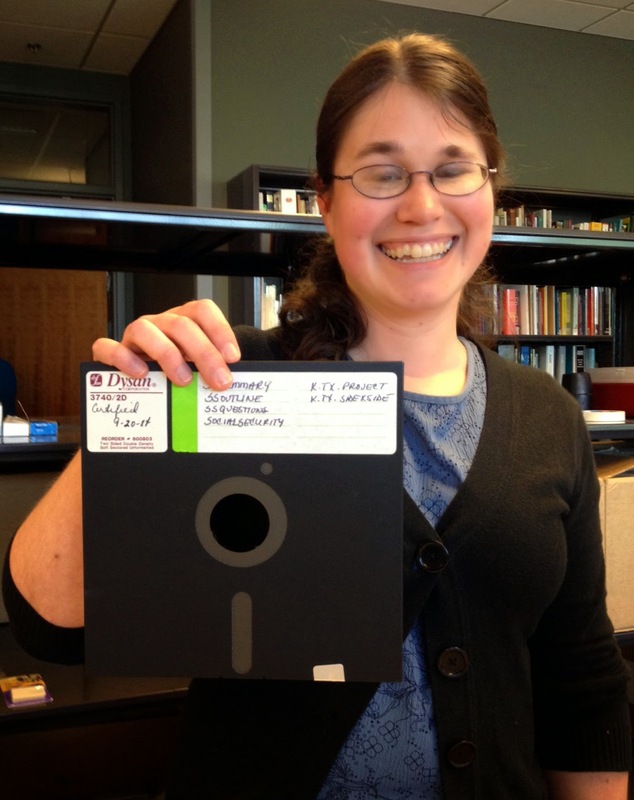 Case in point: this 8" floppy disk (see photo to the left) that I found in the George W. (Buddy) Darden Papers. With storage space of about 80 KB, you can fit the data from over 400,000 of these disks on a $20 flash drive (32 GB). But it was a major advancement in storage space when it came on the market in 1971, storing the information from about 3,000 punch cards, the storage medium of the day. And not only that, but it represented a revolutionary shift in computer use. No longer did a computer user have to have coding skills and write her own programs. You could buy a disk, put it in your computer, and have it work - the ability to sell software was born. All of this to show that computer storage technology changes rapidly, which likely comes as no surprise. Why does this matter? Because people store their important files on removable media like floppy disks or flash drives and tuck them into a drawer for safekeeping. But the fact is these disks and drives are not really safe. Years later, when they come to the archives, or maybe when you want to show your grandchildren photographs from your trip to Europe way back in 2013, these storage devices will be the equivalent of what 8" floppy disks are today and you might not be able to get the data back. As an electronic records archivist, I have been gathering hardware to allow me to read the most common older technology that we have received, including 3.5" and 5.25" floppy disks. But right now we don't have a way to recover the files saved on the disk pictured here. Fortunately, from the disk labels we are reasonably confident that we have paper copies with similar information. If we knew the disks contained something unique, we'd have to look for a company to recover the data for us. When it comes to saving electronic records, you have to prioritize. Interested in learning more? Read about the history of floppy disks and how they changed computer technology forever at The History of the Floppy Disk. Or if you are now concerned about your personal computer files, try the Library of Congress's website or the NSLA Personal Digital Archive Toolkit.